Analysis: The trade is particularly bad news for Adams, considering both he and Howard are big backs with subpar passing-game skills. The Notre Dame product caught on as an undrafted rookie in 2018 and eventually found his way to the lead backfield role, but he played just one snap in two playoff games and likely needs to battle for a roster spot in 2019. 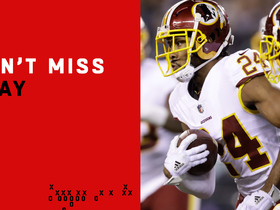 Analysis: After spending much of the latter portion of the season as the primary running back, Adams' Week 16 fumble seemed to mark an abrupt end to that tenure. Still, he finished an impressive rookie season with 511 yards and three touchdowns on 120 carries. He added 58 yards while catching seven of 13 targets. The former Notre Dame standout will likely battle Wendell Smallwood for starting duties again in 2019 in addition to anyone else the team brings in via the draft or free agency. Analysis: Wendell Smallwood got the start and finished with 16 touches on 26 snaps, while Darren Sproles had nine touches on 27 snaps. Adams enjoyed a stretch as the unquestioned lead runner, but he'll enter the playoffs as part of a three-man committee, heading on the road to face an elite Chicago defense. Adams (back) rushed 15 times for 28 yards and a touchdown in Sunday's 30-23 win over the Rams. Adams (back) returned to Sunday's game against the Rams in the third quarter, Daniel Gallen of The Harrisburg Patriot-News reports. Analysis: Adams has now left the game twice for medical evaluation, quickly stepping back in both times. He found paydirt late in the second quarter, but the injury may have cost him a chance at another touchdown, one that instead went to reserve running back Wendell Smallwood. Adams left Sunday's game against the Rams with a back injury and is questionable to return, Eliot Shorr-Parks of Sports Radio 94 WIP Philadelphia reports. Analysis: Adams was evaluated for an unspecified injury during the first half, but he was quickly cleared to return and didn't miss much time. He left again early in the third quarter, clearing the way for Wendell Smallwood to score a nine-yard touchdown shortly thereafter. Smallwood and Darren Sproles will split snaps in the backfield if Adams can't rejoin the contest. Adams logged seven carries for 36 yards and wasn't targeted Sunday in the Eagles' 29-23 overtime loss to the Cowboys. Adams (shoulder) practiced in full Thursday. 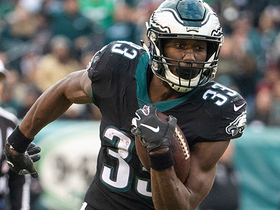 Analysis: Considering his increase in workload the last three games, it's no surprise Adams has been included on Eagles injury reports the last two weeks. During the aforementioned stretch, he's racked up 241 yards from scrimmage and two rushing TDs on 52 touches. Expect Adams to maintain his stranglehold on RB work ahead of Corey Clement and Darren Sproles moving forward. Adams was limited in Wednesday's practice due to a shoulder injury. 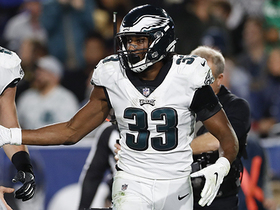 Analysis: Adams has earned 20-plus carries in back-to-back games, but the undrafted rookie also has landed on the Eagles' ensuing injury reports. Last week, he was a late addition due to a hip issue, while he's tending to a new concern this time around. Assuming he gets past the shoulder injury, he'll aim to uphold his standard from consecutive starts against NFC East foes in which he averaged 4.0 yards per carry and scored one touchdown. Adams rushed 20 times for 85 yards in Monday night's 28-13 win over the Redskins. Adams (hip) is listed as active Monday versus the Redskins, Eliot Shorr-Parks of Sports Radio 94 WIP Philadelphia reports. Adams (hip), who is listed as questionable for Monday's game against the Redskins, is on track to play, Mike Garafolo of NFL Network reports. Adams (hip) is listed as questionable for Monday's contest against the Redskins. Coach Doug Pederson said Monday that he plans to give Adams more touches each week, Zack Rosenblatt of NJ.com reports. Adams rushed 22 times for 84 yards and a touchdown while adding a two-point conversion on the ground and failing to haul in his lone target in Sunday's 25-22 win over the Giants. 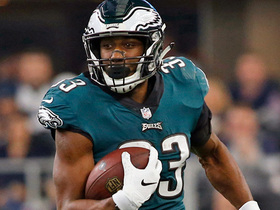 The Eagles are planning to feature Adams as their starting tailback in Sunday's game against the Giants, Ian Rapoport of NFL Network reports. Adams rushed for 53 yards and a touchdown on seven carries and added 19 yards on three catches during Sunday's 48-7 loss to the Saints. Coach Doug Pederson said Adams will get more carries going forward, Zach Berman of The Philadelphia Inquirer reports. Adams carried the ball seven times for 47 yards in Sunday's 27-20 loss to the Cowboys. Adams rushed nine times for 61 yards and caught his lone target for six yards in Sunday's 24-18 win over the Jaguars in London. 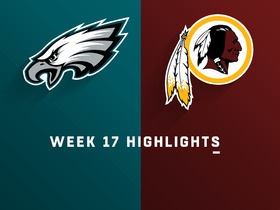 Analysis: Adams led the crowded Eagles backfield in both carries and rushing yards, with Wendell Smallwood getting eight attempts on the ground and Corey Clement getting four. It's tough to rely on any individual from this trio with the other two guys also siphoning work. Philadelphia will be on bye in Week 9. Adams rushed four times for 17 yards in Sunday's 21-17 loss to Carolina. Analysis: Adams tied his season high in offensive snaps with eight, which says a lot about the kind of playing time he's been getting. In contrast, Wendell Smallwood saw 35 and Corey Clement got 25. The rookie was the Eagles' most effective runner on the day, however, so perhaps that will earn him more of a role in London in Week 8 against Jacksonville. Adams saw no offensive snaps in Thursday's 34-13 win over the Giants. 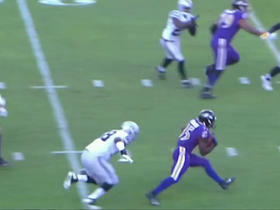 Adams lost a yard on his only carry in Sunday's 23-21 loss to the Vikings. Adams rushed six times for 30 yards in Sunday's 20-16 win over the Colts. Analysis: Adams wasn't on the field much in his NFL debut, but when he was, he was carrying the ball. The undrafted rookie lost two yards on his first career carry, but he gained 16 on the next one, which was good for the Eagles' longest rush of the day. With Jay Ajayi (back) and Darren Sproles (hamstring) both expected back for Week 4 at Tennessee, Adams may be ticketed for the practice squad once again. Adams and Wendell Smallwood are the only Philadelphia running backs not listed on the injury report for Sunday's game against the Colts, Eliot Shorr-Parks of 94 WIP Sports Radio reports. Analysis: Jay Ajayi (back) and Darren Sproles (hamstring) have been ruled out, while Corey Clement (quad) is listed as questionable and tentatively expected to play. The undrafted rookie out of Notre Dame likely falls third in the pecking order, but he could move up to No. 2 if Clement is ruled out Sunday morning or suffers an in-game setback. Either way, Adams is likely headed for the first NFL regular-season appearance of his career. The Eagles signed Adams off their practice squad Tuesday, Mike Garafolo of NFL Network reports. Adams signed a contract to join the Eagles' practice squad, Mike Garafolo of NFL Network reports. Analysis: Adams was waived by the Eagles as part of this past weekend's roster cutdowns and surprisingly passed through waivers unclaimed. He'll now be stashed in Philadephia for the time being, though it's still possible for another team to offer him a contract to play elsewhere. Adams rushed 13 times for 27 yards during Thursday's preseason finale against the Jets. Analysis: The Eagles like what they have in Adams, and it's not hard to see why -- the rookie runs angry yet remains patient and seems to have above-average vision to find running lanes downfield. While his stat line wasn't all that great Thursday, it may not matter in the long run as Adams has looked superior to fellow depth runner Wendell Smallwood all preseason. With that said, Adams is highly unlikely to see significant action in the regular season unless Jay Ajayi (lower body) continues to miss time. Adams is expected to get plenty of reps during Thursday's preseason game, Zach Berman of The Philadelphia Inquirer reports. Analysis: Adams has played a limited role thus far this preseason, but it looks like the Eagles want to see as much out of Adams as possible now that he is healthy and with the regular season right around the corner. He rushed for 33 yards on four carries in Thursday's loss to the Browns. Adams rushed for 33 yards on four carries and lost a yard on two catches during Thursday's 5-0 loss to the Browns. Adams (foot) said he practiced "fully" Tuesday, Les Bowen of the Philadelphia Daily News reports. Adams (undisclosed) returned to practice Tuesday, Dave Zangaro of NBC Sports Philadelphia reports. Analysis: It's interesting to see Adams back at practice shortly after coach Doug Pederson said Matt Jones and Wendell Smallwood likely would be the only running backs available for Thursday's preseason game in Cleveland. The undrafted rookie may now have a shot to join that group, hoping to make his own case for the No. 4 running back job. Adams (undisclosed) won't play in Thursday's game against New England, Eliot Shorr-Parks of NJ.com reports. 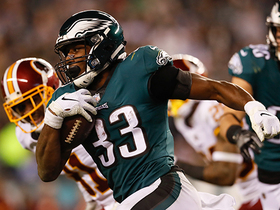 Analysis: Adams played well in Philadelphia's preseason opener last week. However, he suffered an undisclosed injury early in the week and it's enough to prevent him from suiting up Thursday. Look for Wendell Smallwood and Matt Jones to see an increase in reps with Adams out. Adams (undisclosed) was held out of Tuesday's practice and is not expected to play in Thursday's exhibition matchup against the Patriots, Les Bowen of Philly.com reports. Analysis: Adams impressed in the team's preseason opener by posting 30 yards on six carries. It is unclear if his current injury is related to the foot problems he dealt with in the spring, but he is looking unlikely to suit up for Thursday. Given the talent ahead of him on the depth chart he will need to continue turning heads as training camp progresses in order to land on the final roster. 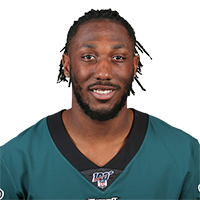 Adams (undisclosed) indicated Tuesday that the issue sidelining him isn't related to the foot problems he had during the spring and he anticipates retaking the field relatively soon, Jeff McLane of The Philadelphia Inquirer reports. Analysis: Adams posted a solid showing during the preseason opener last Thursday and continues to battle for a 53-man roster spot out of camp, so getting back on the field as soon as possible would likely benefit him. Given the team's depth at the position, he would likely need to separate himself to guarantee a spot, but the coaching staff has shown a willingness to give undrafted free agents a shake, with Corey Clement making the roster last season. Adams left Monday's practice early accompanied by trainers after limping off the field with an apparent leg injury, Tim McManus of ESPN.com reports. Analysis: Adams sustained the injury after being tackled near the goal line following a catch and run, though the severity of his issue remains unclear. The undrafted rookie out of Notre Dame missed practice in May due to a hairline fracture in his foot, so there's a chance this incident could be related. Adams mixed in with the ones during Saturday's practice session, Eliot Shorr-Parks of NJ.com reports. Analysis: Coming off an impressive showing in the preseason opener Thursday -- six carries for 30 yards and two catches for 11 yards -- Adams has seen his placement on the depth chart potentially boosted. It's worth noting, however, that both Corey Clement (undisclosed) and Donnell Pumphrey (lower body) were unavailable for the session, which may have impacted his role in the practice. Adams rushed six times for 30 yards and caught both of his targets for 11 yards in Thursday's 31-14 preseason loss to Pittsburgh. 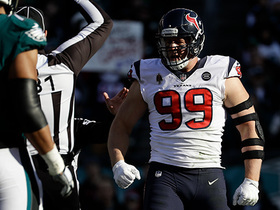 Adams (foot) returned to the practice field Wednesday, Zach Rosenblatt of NJ.com reports. Analysis: Despite going undrafted in 2018, Adams possesses the kind of skills that make him an intriguing prospect to keep an eye on during fall camp. He averaged 6.9 yards per carry in his final season at Notre Dame but enters a crowded backfield in Philly with three established options in Jay Ajayi, Corey Clement and Darren Sproles likely assured roster spots. Still, the Eagles proved last season they aren't averse to holding onto undrafted backs if they prove worthy; Clement went undrafted in 2017. Philadelphia Eagles running back Josh Adams bursts right up the middle for a touchdown run. Philadelphia Eagles running back Josh Adams changes direction for a 24-yard gain. Washington Redskins cornerback Josh Norman intercepts a pass from Philadelphia Eagles quarterback Carson Wentz. Philadelphia Eagles running back Josh Adams runs outside for 18 yards. 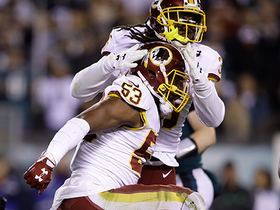 Washington Redskins linebacker Zach Brown stops Philadelphia Eagles running back Josh Adams for a loss on fourth-and-goal. 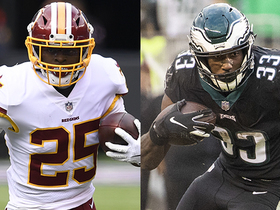 NFL Network's Maurice Jones-Drew and NFL Senior Fantasy Analyst Michael Fabiano offer some projections for the top running backs in the Week 13 matchup between the Redskins and Eagles. NFL Network's "NFL Fantasy Live" crew spotlights players whose fantasy stocks are rising or falling heading into Week 13. 'NFL Fantasy Live' ranks the top 5 running backs from Week 12 for fantasy.